For being born somewhere else. 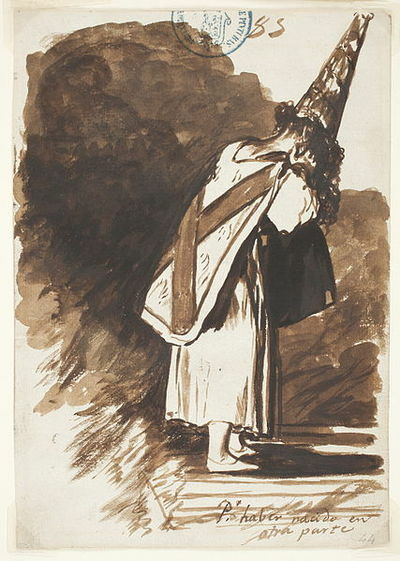 Francisco Goya, 1810. Some people look down on particular genres or even specific books for being too low brow, too silly or even just too popular. Are there books you would be embarrassed to be seen reading in public? I often go back and read children's books that I enjoyed when I was younger, and I wouldn't really want to be seen reading them in public. Anne of Green Gables is another I might not want to be seen reading, but that's partly because when I first read it as a kid, some of my friends made fun of it (without knowing I was reading it) so it's kind of habit to avoid admitting I've read it (and recently read many of the other Anne books too). I do that too. I also get a bit self conscious about the fact that I sometimes watch children's tv shows just by myself without my kids. I cannot believe people are embarrassed to be seen reading children's books! I love children's books. I have a bigger collection of children's books than I have of adult fiction. Having said that, I studied children's literature at uni, so that would explain why. Anyway, to answer the question - Twilight. No question about it. Again, sorry about double-up. Internet. As much as I enjoy a good urban fantasy novel with a strong female lead. All too often their cover artists end up with the standard: tattooed girl poses with weapon while wearing a tanktop or something backless to show extra flesh, possibly with an animal/supernatural being in the background. And the book could have great action and story, but when someone asks to see what you're reading, the conclusions that one jumps to from the cover sometimes require a fainting couch. Not that the ones with male protagonists are any more original(999 variations of Guy in Trenchcoat) but they're not embarrassing to hand over if someone asks what you're reading. Very true. The heroines often look like that on the cover even if they don't in the actual book. It's like the way the men on the cover of romance novels often have mullets even though the characters are never described as having one. The great thing about ebooks is no one can see what you're reading. "50 Shades of Grey", "The da Vinci Code", Cliff notes of "Foucault's Pendulum" so you pretend you've read and understood it... all nicely hidden because no one can see the cover. Yep, e-readers are brilliant for that. There's also a more old fashioned solution of using a reuseable fabric cover over your book. I think they're supposed to protect the book if you take it to the beach and stuff but I've seen them for sale in a romance specialist bookstore so I reckon they're really for hiding what you're reading. Although I do love them, I am embarrassed to be seen reading children's books. Generally I'm not too embarrassed by the books I read, however I have to confess that I did give the 50 Shades novels a read to see if they lived up to the hype and did feel a tad embarrassed reading them on the train. I'm a bit old school so don't use a kindle so there's me sat on the train next to cute little granny's reading quite the risqué novel. I didn't feel they lived up to the hype personally. Not the greatest read. Nope, no books I am embarrassed to be seen reading in public. BUT, there are places that I wouldn't want to be seen reading a particular book. I wouldn't want to be seen reading a novel in a business meeting. I wouldn't want to be seen reading adult sexual material in front of my children. I would probably move away, or put the book away, if I was reading something and the people around me were making fun of what I was reading. I would stop reading, or hide what I was reading, if what I was reading would disturb or upset someone else (and most likely that would be the cover, so an e-book reader probably wouldn't be an issue). I'd have to say Shades of Gray. I won't read the series in public as I am too embarrassed to be seen reading them. I don't think I was embarrassed to read any book. I have read 50 shades and all my friends and peers knew I was reading it, but I wouldn't let my parents know that I was reading the series as I read them while I was visiting with them in USA. IF I were to get embarrassed by reading a particular book 'in public', why the hell would I read it 'in public'? I'd read it in the privacy of my home. What I read in public is really nobody else's business. As long as it's not offending 'public morals', it's ok by me! Not the normal 'run of the mill' books, but to me absolutely fascinating, as they involved just two of my favourite subjects', Geology & Aviation. I agree with Simon Yang's comment! I don't mind reading urban fantasy novels sometimes but the front covers can be a little bit embarrassing! They're the books you read in the privacy of your own home...not for the content but because of the cover art! Not embarrassed by it but I do like comics and crime. I guess the Shamini Flint and Donna Leon's are my go to junk crime. Actually, Audio books are what people sneer at. I say I read it and then when they find out it was audio, they sort of say "but you didn't read it" - except I'm still citing quotes or talking about it, so I don't get the big deal. I was driving 8 hours extra a week for 2 months, I churned through the audio books, and it made me less resentful of all that time in the car.